We’re taking a stand against Nestlé’s water bottling proposal for the Columbia River Gorge on February 8th in Portland! Join us for a day of action and Aerial Art Mob against Nestlé! 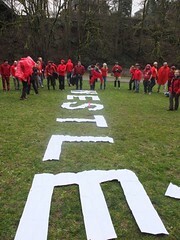 Create human-powered aerial art to send the message to the Governor and the Oregon Department of Fish & Wildlife (ODFW) to say ‘No’ to a Nestlé water bottling plant in the Columbia Gorge! Call on your state agency, ODFW, to stop cutting the public out of its controversial decision to pursue a water exchange that would let Nestlé bottle public water! 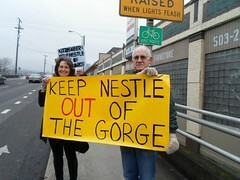 Have fun with fellow concerned Oregonians who want to keep a Nestlé bottling plant out of Oregon! Morning rush hour bridge action: 7:30 until 9:00am we will hold signs on the east side of the Hawthorne Bridge (at SE Madison and Grande Ave). Drop by, grab a sign, and help spread the word. Signs and donuts provided! Take an hour of your day to help create some amazing aerial artwork, get updated on the campaign to keep Nestlé out of the Gorge, and call ODFW to demand they stop doing Nestlé’s bidding. 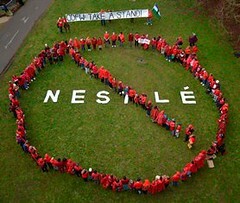 We will arrange ourselves into a huge ‘No Nestlé’ symbol (that’s why we need you to wear red!) and take photos from above to help spread the word about this crucial issue. For the noon action: come dressed in red – it will help make the image powerful! Bring an extra red shirt(s) if you can in case we need them. Carpools can be arranged if necessary. For more information email or call jdegraw(at)fwwatch.org or 971-266-4528. CANCELED Tell ODFW: Don’t take Nestlé’s bait! Nestlé is trying to bait the Oregon Department of Fish & Wildlife (ODFW) into “exchanging” publicly owned water (our water) so that Nestlé can bottle it and make millions. The ODFW Commission is the boss of the agency’s director Roy Elicker, and can stop Nestlé by simply withdrawing the permits that would allow Nestlé to profit off of public water. Join us to stand in solidarity as individuals testify to the Commission with this message: Nestlé Waters is NOT welcome in our state and ODFW should NOT get into the bottled water industry. Bark will provide coffee and donuts and is organizing a carpool. RSVP at this link for more info or to help! 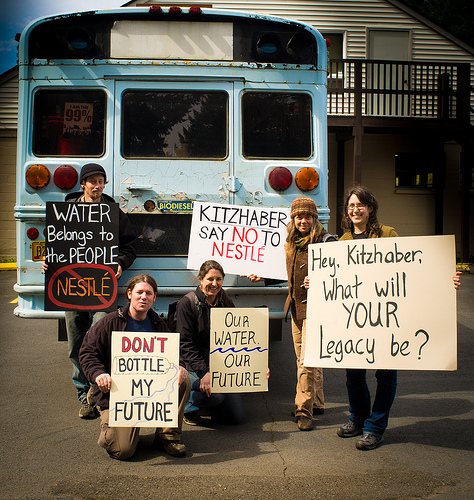 It is now official: the Keep Nestlé Out of the Gorge Coalition will appeal the Oregon Water Resources Department’s (OWRD) approval of permit applications that inch Nestlé closer to bottling Oregon’s water. The coalition, representing labor, religious, environmental, public health and consumer advocacy groups, maintains that this water exchange is not in the public’s best interest. This is a stance they have steadfastly maintained over the last two years in their opposition of the Nestlé water bottling plant. “It is the State’s job to safeguard Oregon’s public resources, especially our precious water resources for the benefit of all Oregonians, not multinational corporations. Allowing the Oregon Department of Fish and Wildlife (ODFW) to move forward with this water rights exchange would permit a state-owned resource to be used for a private business model that is unsustainable,” said, Jackie Dingfelder, Oregon State Senator for District 23. Kitzhaber is the one person that could advise the ODFW to pull out of the water exchange process. The coalition has been calling on Governor Kitzhaber to stop the controversial water exchange. Kitzhaber has heard from over 10,000 Oregonians urging him to stop the exchange and his Natural Resources Department staff has met with the coalition to get the facts on this controversial issue. Additionally, the governor has received Ecotrust’s economic study that outlines why extractive industries like water bottling are not the best path forward for economic development in Oregon. Even with all of the calls and letters from Oregonians desiring protection of their water and his Natural Resources Department meeting with the coalition to discuss the issue, Kitzhaber remains quiet. The Nestlé water bottling plant proposal is, as stated earlier, not in the best interest of the public or for Oregon. 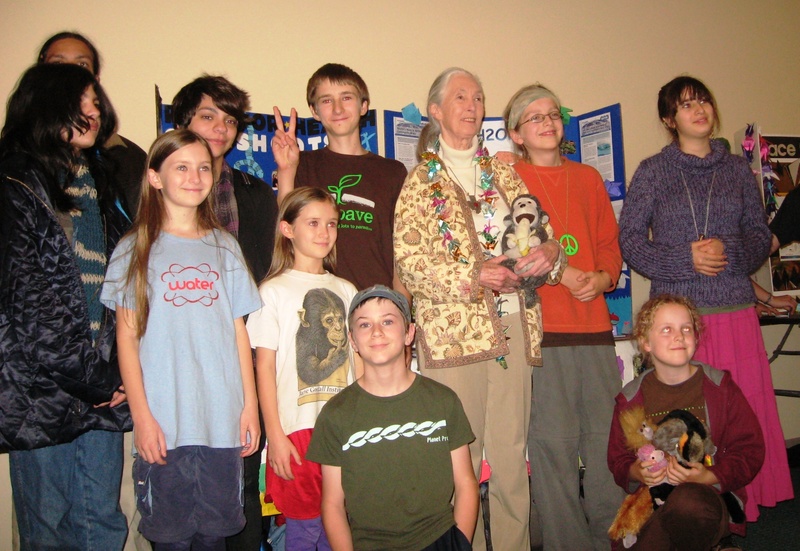 In fact, it is in direct opposition of Kitzhaber’s desire for a greener and more sustainable Oregon. “At a time when local governments in Oregon are discouraging wasteful plastic bottles, why are our state agencies encouraging Nestlé to develop a plant that could produce over 200 million plastic bottles every year? We should know better,” said Barbara Willer, former Multnomah County Commissioner. Allowing the transfer applications to go through and the bottling plant to be build would make a mockery of the state’s pledge to discourage wasteful practices (i.e. use of plastic water bottles). 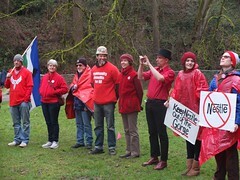 Lastly, Keep Nestlé Out of the Gorge will continue to oppose the water exchange proposal in conjunction with Crag Law Center, and also ramp up efforts to gain Governor Kitzhaber’s support in protecting Oregon water resources from Nestlé. Said Julia DeGraw, Food and Water Watch’s Northwest Organizer: “Nestlé’s search for water has stirred up controversy in California, Colorado, Florida, Maine, Massachusetts, Michigan, Wisconsin and other states… [T]ime and time again, Nestlé has demonstrated that it does not have the communities’ best interest in mind when it comes to bottling public water resources.” It is now time to show once again that Nestlé and their water bottling plant is not in the best interests of Oregonians and not in the best interest of the state of Oregon. 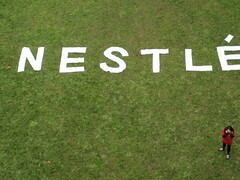 Food & Water Watch Continues to Build Movement to Stop Nestlé at the Muddy Boot Organic Festival! Last week, Food & Water Watch had a table at the Muddy Boot Festival as we continue to gain support for and discuss the “Keep Nestlé out of The Gorge” campaign. 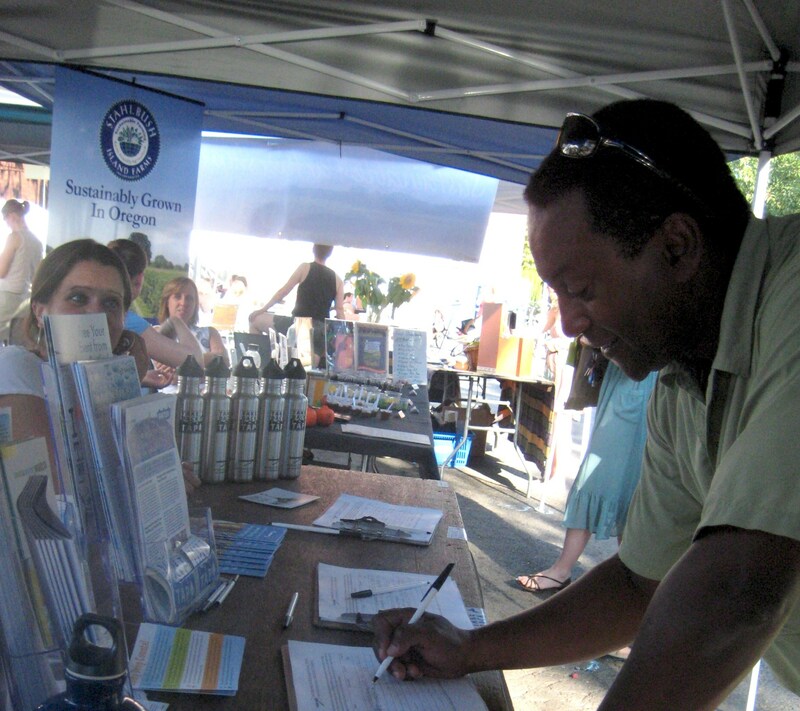 Unfortunately, the festival this year coincided with the heat wave and the hottest temperatures experienced in our late Oregon summer and while the turnout was low, Food & Water Watch wants to thank those of you that did come out to visit. It was an incredible treat to continue engaging in so many conversations (many of which were extremely profound) on stopping a give-away of our water by the Oregon Fish and Wildlife so that Nestlé can bottle and sell it for profit. 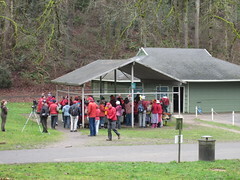 For the entire weekend, Food & Water Watch had, in addition to myself, 5 volunteers that ran the table collecting signatures asking Governor Kitzhaber to not allow Nestlé to bottle our water.